I feel like the reflections have been really weird. They look like they've been put there digitally throughout the episodes but I haven't seen any obvious discrepancies. I know Richard's reflection on Miriam's door was too "reflecty." Now this one. Audrey might have had one in this episode too? Can't remember now but someone had an unsettling reflection that I was keeping my eye on. Didn't notice anything at the time. Well it was green for this episode and when I saw it, before the episode started, the ring immediately came to my mind. 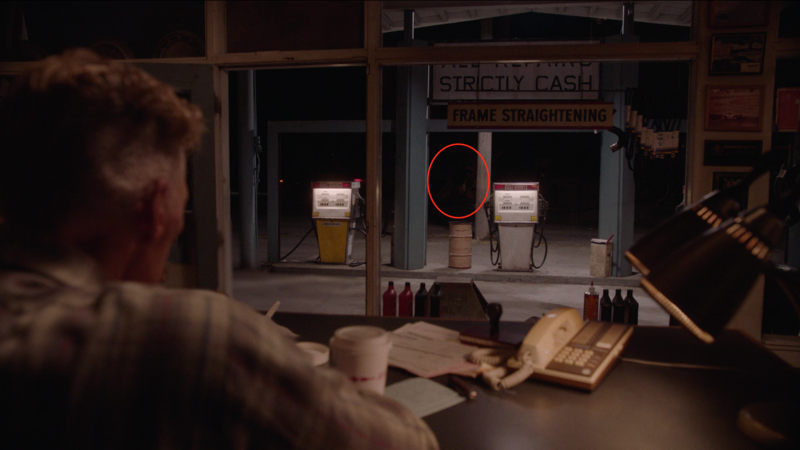 Can someone please break it down for me re: the reflections in Big Ed's scene? I'm probably dense, but have watched that clip (in this thread) four times, and don't even see a reflection -- of anything. I just see Big Ed, with two cups. I feel like the reflections have been really weird... I know Richard's reflection on Miriam's door was too "reflecty." The reflection is above the white trashcan. Stare at the space above the trashcan and you can see it. The reflection is indeed moving when he's not. Also it skips a few frames. At least it's happened the 10 times I've played it on Netflix. I've marked the reflection on this screenshot. Audrey might have had one in this episode too? Can't remember now but someone had an unsettling reflection that I was keeping my eye on. Didn't notice anything at the time. Audrey's reflection was odd very pale and I tried to note it on the second watch. There was also the coffee cup reflection in the Mitchum's house the previous episode that people thought was someone in the bushes. I will agree the reflections have been odd. But that last scene going through the credits had a meaning a contemplation if not a translatable meaning. Ah, ok. I see it now. Thank you! Rational explanation: the reflection comes from CCTV display which lags few seconds and has low FPS.
? How could that be squarely right in front of him where his own reflection should be? It looks like he's holding the cup up when he's not, then it drops suddenly. My thought was the reflection was edited to get rid of a visible camera but it seems intentionally odd. It looks like Ed himself is seeing it too. Big Ed’s reflection is nothing more than the reflection of a man’s missed life, stuck in Twin peaks, owning a lousy run down gas station, used to be married with a half crazy woman (Nadine) that he did not love. He could not get the woman he loved. He went away to Iowa to sell John Deere. It probably did not work because he is back in Twin Peaks and now there seems to be another man cutting his grass. May be there is other meaning into Big Ed’s reflection but maybe not. Maybe we will find out later? May be not!